The Nokia 5330 Mobile TV Edition is armed with a 3.2 megapixel camera for image resolution of up to 2048 x 1536 pixels. While it lacks autofocus it at least packs a LED flash. The LED flash is also rather inadequate, only really usable in rather close ranges. Typical Series 40, the camera settings are rather limited but reasonable given the mid-range targeting. 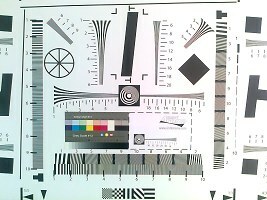 The available settings include white balance, three quality levels going from basic to high, and various effects. Sequence shots and shooting in both portrait and landscape mode are also among the available options. The 5330 doesn't rank among the top 3.2 megapixel shooters in terms of image quality. Images are a bit oversharpened, but with good contrast and acceptable color rendering (save for the occasional bluish/greenish tint). Noise levels are normally quite high and the aggressive noise reduction that kicks in takes its toll on resolved fine detail. At 100% magnification there's easily visible watercolor effect on most surface textures. Generally the lack of detail in images is a major weakness along with the limited dynamic range, which easily leads to underdeveloped shadows or blown highlights. The camera speed is reasonable enough. 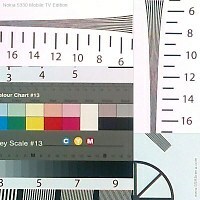 We also snapped our resolution chart with the Nokia 5330 Mobile TV Edition. You can check out what that test is all about here. Things get even worse when we talk about video recording. The 5330 manages QVGA resolution at 15 fps that only seem good enough for MMS purposes. Here is a video sample for you to check out. The Nokia 5330 Mobile TV Edition connectivity options are somewhat limited by the lack of 3G support. And while you miss the joy of browsing over 3G you at least get EDGE and quad-band GSM support. There is neither Wi-Fi nor GPS. Bluetooth version 2.0 is supported. Finally, the memory card slot, which can sometimes be the most convenient way of transferring data, is also present and as you already know it’s hot swappable. The microUSB port on the Nokia 5330 is good for transferring files as well, plus you can charge your phone over the USB cable. You’d have to buy one yourselves though as Nokia hasn’t bundled one with the phone. The Nokia 5330 Mobile TV Edition has an integrated WebKit-based HTML web browser. We guess that rings a bell. Apple's Safari and Mobile Safari are based on WebKit, as well as the browser for the Android platform and the Palm Pre. It's safe to say that 5330 is in good company. This is not to say however that you will get a similarly good user experience as those are very different devices we are talking about here. However the WebKit background helps the browser render pages accurately and that is a vital improvement over the previously used web browsers in S40 devices. The Nokia 5330 native browser still has its shortcomings though. There are obvious indications that the hardware is not quite up to the job – for one, scrolling is quite slow. Flash is also not supported - there's some rudimentary support but it's just enough to display certain banners, nothing more. Like most other S40 phones recently, the Nokia 5330 Mobile TV Edition also comes with the Opera Mini browser preinstalled. It speed up that browsing with its “Up to 90% compression”, which is vital when relying on a slow non-3G connection.